I haven't given up riding, I've just got really bad at blogging! I've got a couple of posts to catch up, and am going to date them at roughly the correct time, but here is a smattering of photos from the late summer and autumn. I wanted to go and take some pictures with Mamiya 6 (a 120 medium format film camera) to try out some cheap mailers, so went riding along the Mississippi River in Saint Paul. 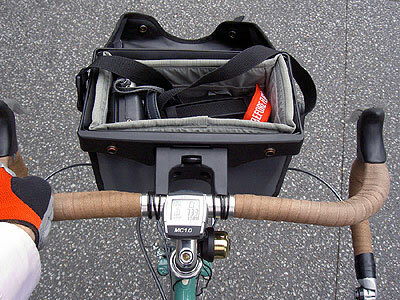 Here's how I carried the camera; in the usual camera bag in a basket mounted on my Topeak rack. These racks are pretty ugly, but you can quickly interchange components using a sliding attachment, some spare ones of which I bought last spring. 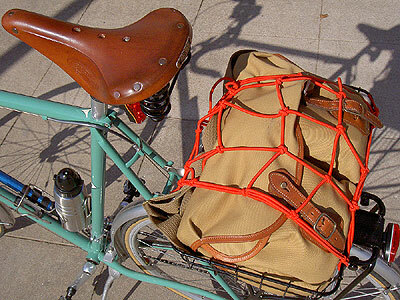 This isn't even a Topeak basket, it's a Wald with a Topeak mount on it. Anyway, this works great for Bicycle Based Photography. 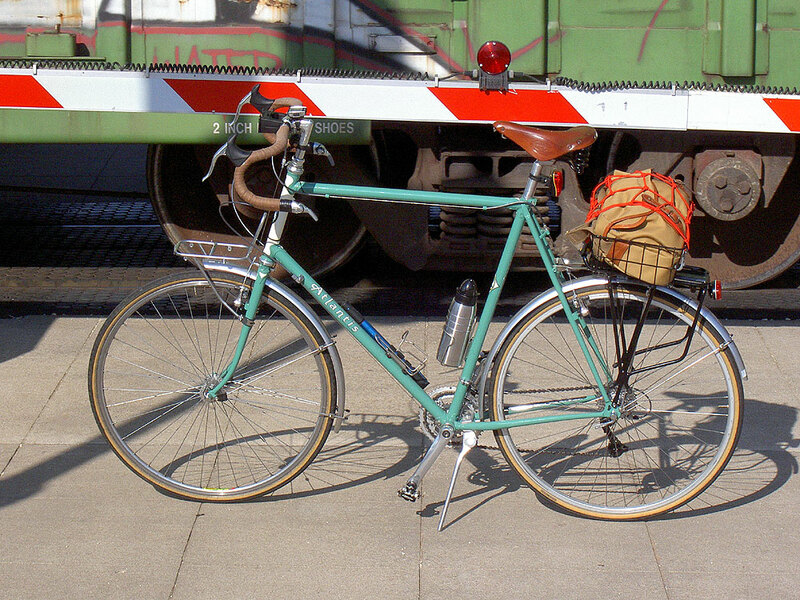 You ride to the spot, part the bike (the kickstand is great for this, as when this train went through), pull out the camera bag and shoot away. This is how the Atlantis was set up in late summer, with the cute but so far largely-unused Nitto front rack. Here's the Billingham camera bag in the basket on back. The bag has some padding to protect the camera. Also notable here is the stainless steel Jong Won JSB-500 double-walled water bottle, which will keep ice water icy for hours even on hot sunny days, and hot coffee plenty steamy on an hour's ride to church in the winter. I love how bike magazines talk about "the cockpit" of bikes they test, like it's real complicated or something. 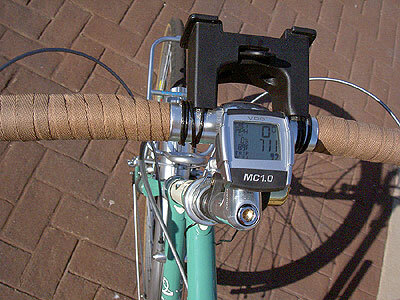 Somewhat more cockpit-like than usual is this VDO computer, which has an altimeter and temperature. I'm at 711 feet about sea level here at 89 degrees Fahrenheit, and am pretty sure the altitude's right because I, being a nerd, rode to Holman Field to set the base altitude one evening (704 feet at the north end of Runway 14/31), then rode straight home to establish my garage's base altitude (916 feet ASL). You have to reset the base each morning (or at known altitude locations, like airports, Continental Divides, the ocean, or the top of Mount Everest) because changes in barometric pressure will fool it. 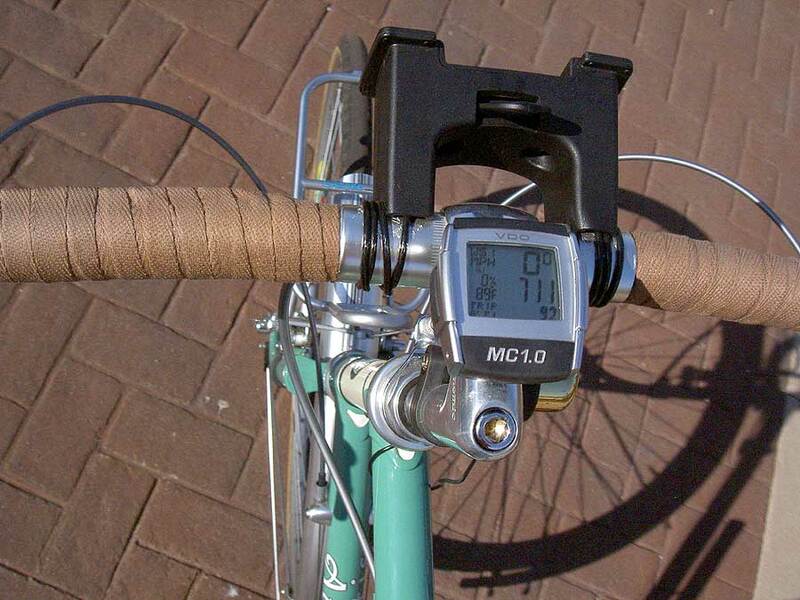 It also can get fooled, so that when I take it out of my air-conditioned office into hot summer afternoons and ride home, the temperature-compensation can give misleading altitude gain readings as the thermometer catches up to the heat. Ah! 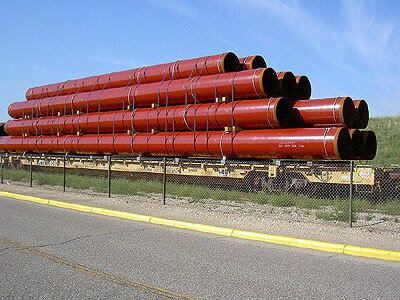 A new shipment of tubes so Rivendell can make some more Atlanti! 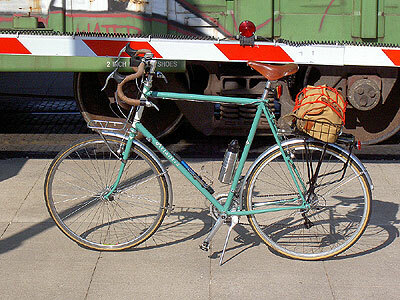 Gotta love steel bikes! When my employer asked me (as a commuter) about bike racks, I developed an unhealthy interest in bicycle parking. This, by the way, will get you nowhere with the babes at parties. In any case, driving back from dropping the kids off at camp Karla and I stopped in Forest Lake. 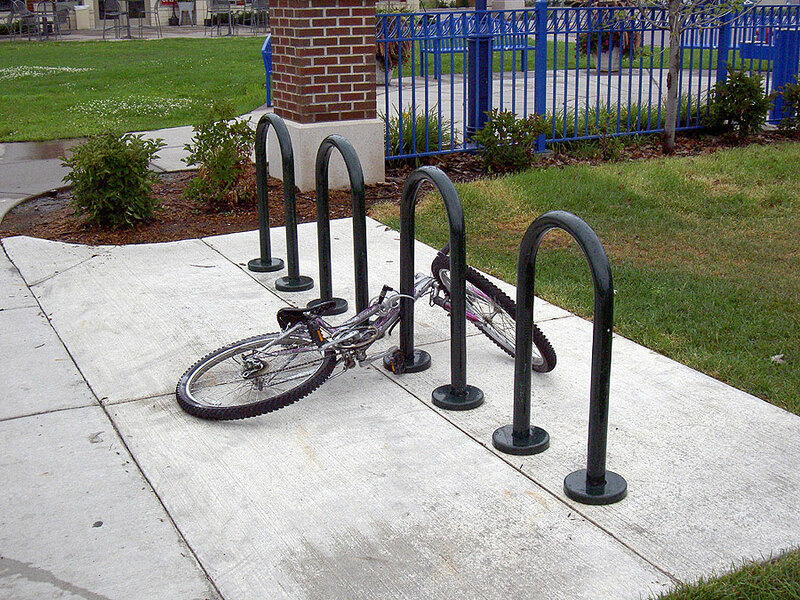 They've developed their lakefront, and installed their U-racks improperly (they should be parallel to each other, not in a line!!!). 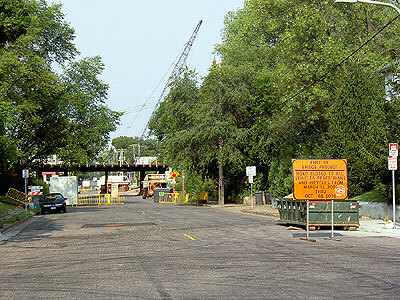 Meanwhile, back in Minneapolis, Phase III of the Midtown Greenway came into wide use well before its official opening. There are thoughts about extending it across the Short Line Bridge into Saint Paul, which would be great. 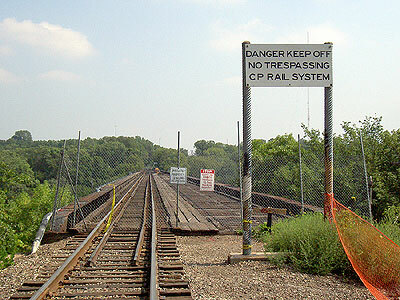 Sadly, there was a fire on the bridge over the summer that damaged it. 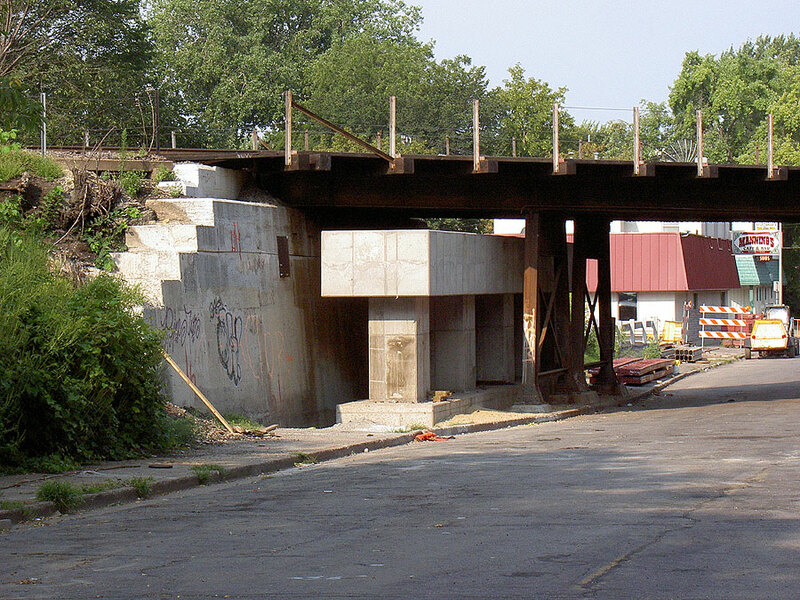 I was glad to see repair machinery out on the structure and have since seen trains at the elevators on the Minneapolis side of the river. The Greenway ends here at the moment, and the fencing is much more formidable now, but in August I could still walk right up. That's not the only bridge work. 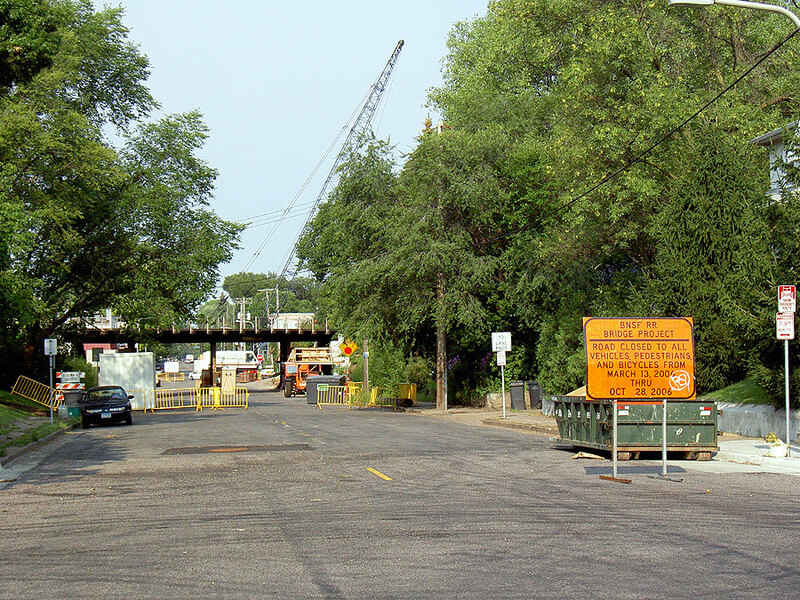 In the summer of 2005 Como Avenue, a good way to downtown Minneapolis for me, was closed for months while they completely rebuilt it. 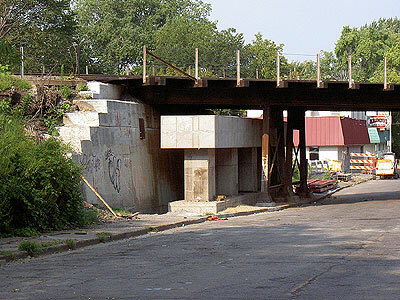 In the summer of 2006, the street was beautiful but now the railroad was rebuilding their bridge across Como Avenue by Mannings Cafe. On weekends, you could pick your way through. During the week there were lots of construction guys around and I (on the way to my dentist in downtown Mpls), took the detour. You can see the new supports here alongside the old steel (or iron?) ones. The new ones won't have a support in the middle of the road like the old ones did. The trick to all this was keeping the rail lines open during construction. Funny that I'd take photos of bridgework on the way to the dentist! Ho ho. The road is open again. Another way of carrying cameras. 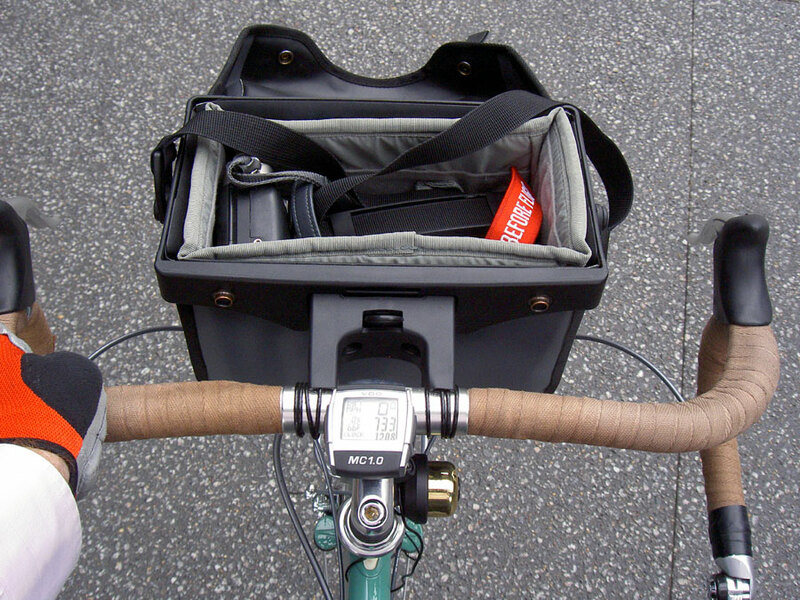 This is an Ortlieb front bag with the camera insert. This insert provides some padding and structure to the insides of the bag. In this instance, I'm carrying a Contax G2 film camera in there. One day in September I rode the Intercampus Transitway going towards Minneapolis and at the end, instead of vast empty parking lots, there was a fuss going on. It was the ceremonial groundbreaking for the new University of Minnesota football stadium. Some official was blathering on about the commitment to excellence and proud football tradition and how the new stadium would be great. Personally, I thought they were idiots to get rid of the old stadium, about a block away from where this ceremony was taking place. They had a nice brick traditional stadium and knocked it down to make way for the Aquatic Center. Swimming pools are nice, I guess, but college football in the sterile environs of the Metrodome is just lame. I thought they were nuts when they made the move, in 1982, and it's rewarding to see them come full circle and essentially admit it was a mistake. Now, as a Minnesota taxpayer, I get to help pay for this farce! 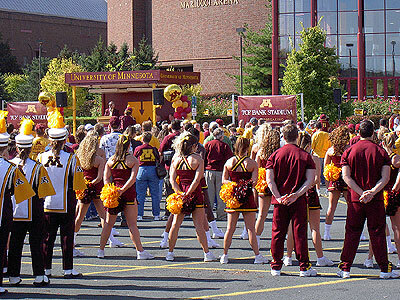 This evening, the Gophers took on the University of Michigan and lost 28-14. There are some grain elevators where this stadium's going. In the well-established tradition of actual productive businesses making way for entertainment venues, these will be knocked down to make room for a few football games each year. 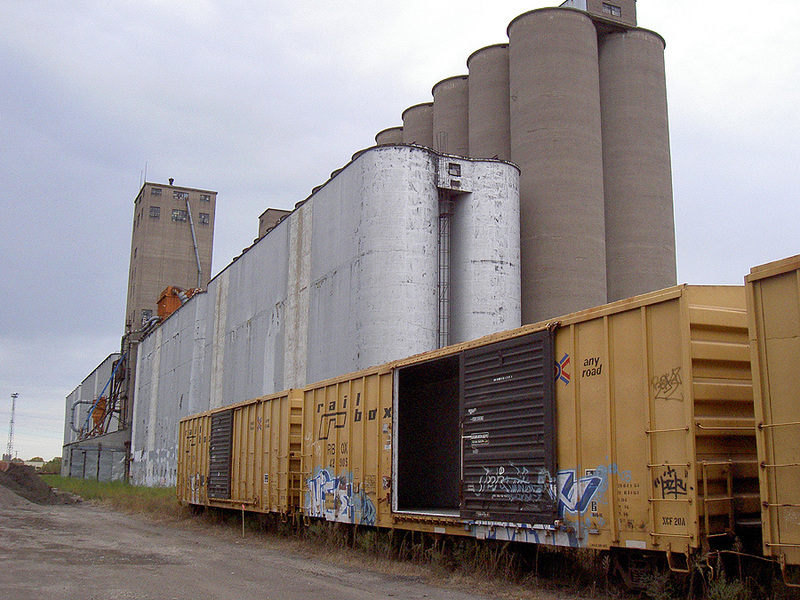 The U (as the University of Minnesota is known in these parts) apparently has bought these silos. The warning signs are to keep people out. There have been occasional deaths of kids playing in grain elevators and falling to their deaths. 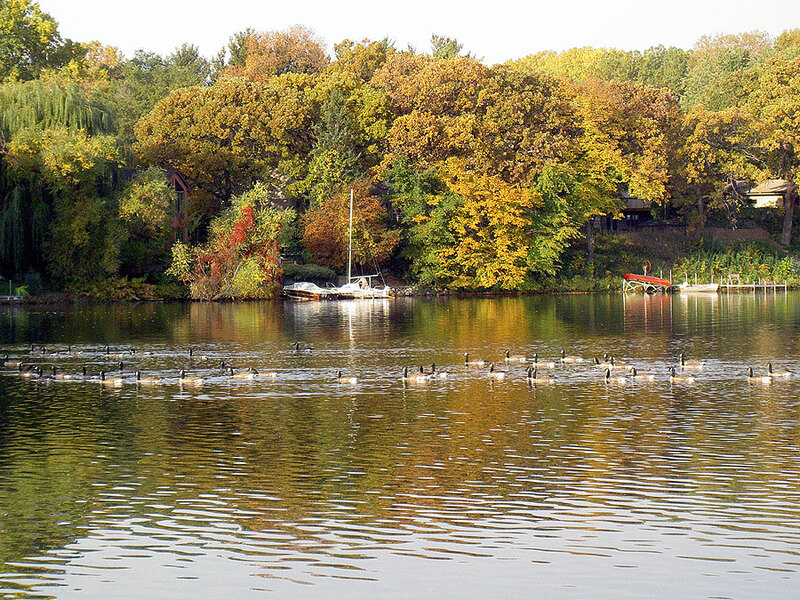 The lameless and futility of the University of Minnesota football team is a perennial feature of life here, but so is the beauty of fall. 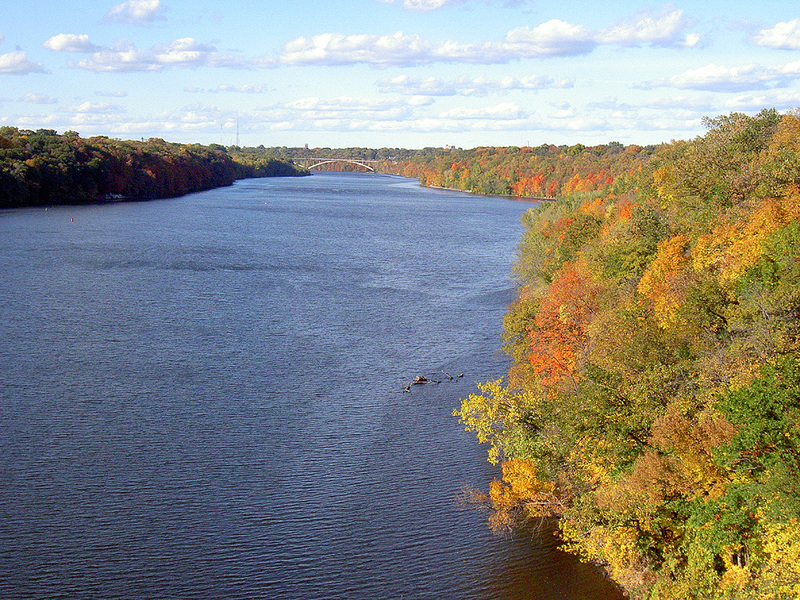 This picture is north up the Mississippi River gorge from the 46th Street/Ford Parkway bridge at the end of September. Since I'm catching this up later, I can report that the University of Minnesota Golden Gopher football team, playing in the storied Insight Bowl, gave up a 38-7 third-quarter lead, allowing Texas Tech the largest comeback in college bowl history, and lost. A day or two later, the coach was shitcanned. 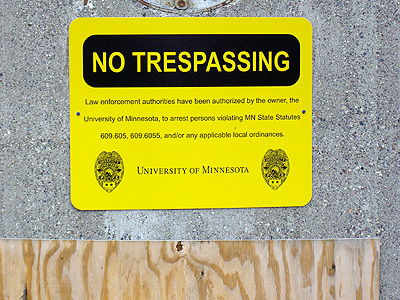 Ahhh, the proud traditions of U of M football! And on the way to work one day there was a flock of birds paddling by on Lake Johanna. I pulled over, dismounted, and took this photo.